Both Eastern Conference semi-finals are locked at 1-1 after Saturday brought home wins in both games. A strong performance from the Barys power play inflicted a first playoff loss of the season on Avangard, while Avtomobilist shut out Salavat Yulaev to win 2-0. Barys bounced back from defeat in the opening game of this series to shoot down Avangard with three power play goals. Dustin Boyd led the scoring with two goals, Brandon Bochenski and Jesse Blacker also found the Hawks’ net. There was little to choose between the two in the first period. Barys had more of the possession, Avangard produced more shots on goal but neither team could score in the opening 20 minutes. The turning point came midway through the second period, with Barys getting two goals in five minutes to take a grip on the game. Jesse Blacker opened the scoring on the power play; the Canadian defenseman fired home from the blue line after Viktor Svedberg’s shot was saved and the rebound travelled far from home to present Blacker with a shooting chance. Next came Dustin Boyd, whose crunching hit on Sergei Shumakov in the corner took the Avangard forward out of the play and created plenty of space in front of Igor Bobkov’s net. By the time the puck returned to Boyd he was occupying that territory and despite the efforts of Alexei Emelin to get back to him, the home forward had little difficulty in converting the rebound from a Dmitry Grents shot. Shumakov gained a measure of revenge early in the third period when his goal brought Avangard back into the game. The forward worked the angles with Taylor Beck; the Canadian looked well-placed to shoot but instead returned the puck to Shumakov at the far post and the visitor had a power play goal to make it 1-2. Barys managed to go 42 minutes with incurring a penalty, but allowed a goal on the first occasion it was left short-handed in this game. 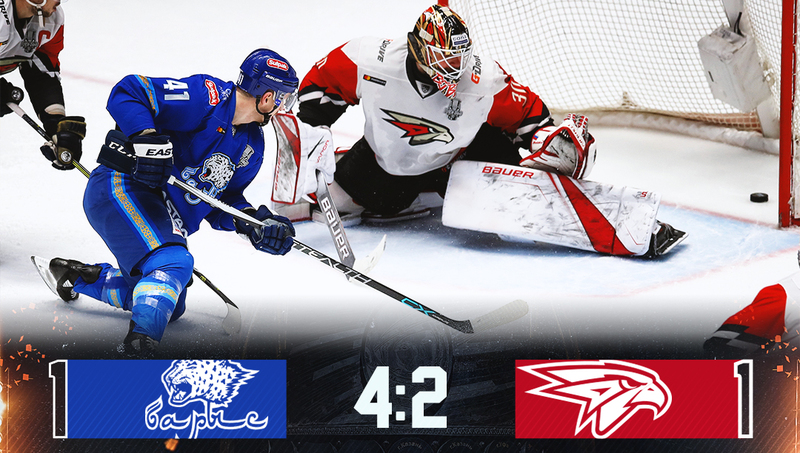 However, it wasn’t long before Avangard took a penalty of its own and Barys restored its two-goal advantage. It took just two seconds to capitalize on Emelin’s indiscretion: Patrice Cormier won the draw and Brandon Bochenski smashed home the puck. Boyd then added another close-range finish for a third power play goal of the game for Barys, putting the game beyond the visitor. There was a late consolation goal for Avangard when Ilya Mikheyev deflected Cody Franson’s shot past Henrik Karlsson as the visitor went two-for-two on its own PP, but that wasn’t enough to escape defeat. The teams head to Balashikha next week for the next two games of this Eastern Conference semi-final with the series perfectly poised at 1-1. First of all, I’d like to thank our fans for generating another fantastic atmosphere in the arena tonight. I wouldn’t say that the opposition had a clear advantage in the first period. For the first five or six minutes that was probably true, but we worked on it and we understood where we needed to do more. After that we started to play the kind of hockey that we want to see here. But this is just one game, the series is tied and we have to get ready to go on the road. What did you think of the incidents involving Sagadeyev and Asetov? Let’s not turn this press conference into a conversation about referees. We’ll look at the incidents and, if there’s a problem, of course we’ll raise it with the disciplinary committee. I’ve already spoken about how the three times we asked the committee to look at something the verdict was in our favor. I don’t understand why it didn’t happen on the ice. The three periods were like three different games. In the first period we had the initiative, we should have scored but we didn’t get the goal. In the second, Barys took its chances and went up 2-0. After that we tried to get back into it in the third period, we were looking to create chances and get goals. But again, they took their chances and that’s why the score ended up the way it did. Shut-outs are proving to be common currency in games between these two teams. In regular season play, Avtomobilist twice blanked Salavat Yulaev. On Thursday, this series began with Juha Metsola denying the Yekaterinburg team as the men in green skated to a 1-0 win. Today, though, the power was back with Jakub Kovar in the Avto net. The Czech goalie made 25 saves to record his 10th shut-out of the season, and his second shut-out in playoff action this year. It was also his third KHL career playoff blank and his third against Salavat Yulaev this season. Most importantly, though, it helped his team to a valuable victory, tying up the series before the teams head to Ufa for the next instalment on Monday. The home team went ahead midway through the first period, scoring on its first power play of the game. Salavat Yulaev was already anticipating the return of Maxim Rybin when Alexander Kucheryavenko fired in the puck from the corner and Georgy Belousov forced it into the net amid a scramble in front of Juha Metsola. The Finn blanked Avtomobilist on Thursday in the opening game but kept the home offense at bay for less than 10 minutes in this game. Avtomobilist doubled its lead after 26 minutes following a mistake by Alexei Semenov. The Salavat Yulaev defenseman was caught in possession as he left his own zone and Anatoly Golyshev surged forward before setting up Stephane da Costa at the near post. The Frenchman, back in action after missing game one due to a suspension, converted the opportunity. Ufa’s problems got worse late in the middle frame when captain Grigory Panin was ejected from the game after a high hit on Evgeny Chesalin. There was little doubt about the verdict; the defenseman’s shoulder slammed into his opponent’s face. Avtomobilist’s Evgeny Grachyov took an interference minor for his attempt at retribution following the incident. That penalty slowed Salavat’s efforts to get back into the game at the start of the third period and much of the opening 10 minutes were played in the visitor’s zone. Gradually, things changed: Maxim Mayorov’s dangerous one-timer tested Kovar, Vladimir Tkachyov narrowly failed to redirect an Anatoly Yelizarov effort into the net. However, despite plenty of possession in the final third, Salavat Yulaev struggled to carve out clear scoring chances. Late in the game, Teemu Hartikainen could not convert a Linus Omark feed from behind the goalline moments after Francis Pare squandered an empty-net chance at the other end. Avtomobilist held on to secure the win and tie the series. This game was like a mirror image of the first. They scored on the power play and held that advantage to the end of the game. We couldn’t do anything about it, we couldn’t solve their goalie and their defense. Do you feel that Panin let your team down? No. He went for a hit, no malicious intent, and unfortunately he went a bit high and hit the player’s head. It happens; today it went their way, another day it goes our way. It’s one of those things, especially with a defenseman who likes to play tight. It’s just part of the game. Unfortunately Panin hit the other guy’s head and took his punishment. The guys tired themselves out on defense today, thanks to them for all that work. Congratulations to Kovar on his shut-out. I think we were well prepared, we were tight and well-organized on defense. We learned something from the first game and tightened up a bit in some areas. Our offense was pretty good today, we had a lot of shots. But the only thing that mattered was getting the win and we did that. Does Avtomobilist have a psychological advantage in the rest of the series now? Not at all. I don’t see any psychological triumph here. It takes four wins to finish the series, the teams are evenly-matched on almost every line. It’s going to be a tough battle.